During the Age of Enlightenment, Francis Bacon gave one of the most famous definitions of knowledge: knowledge is power. This statement remains relevant today. Information gives people the power to make decisions and become successful. The human civilization thrives through knowledge. The schooling system gives us the fundamental preconditions to become knowledgeable people with the power of information. Education is a human right, and each country has the responsibility to provide it to its citizens. In the modern educational system, which is mostly driven by technological progress, the role of the parent is just as important as the one of the teacher. The changes in education, driven by information technology, bring a new climate to life. The teachers are no longer the only sources of knowledge for the students, and the school is not the only center for learning and development. This situation obliges the teachers to invest in continuous training, so they can adjust their methods to the needs of new generations. The parents, however, share the responsibility to help their children to develop skills that the modern society will require in future. 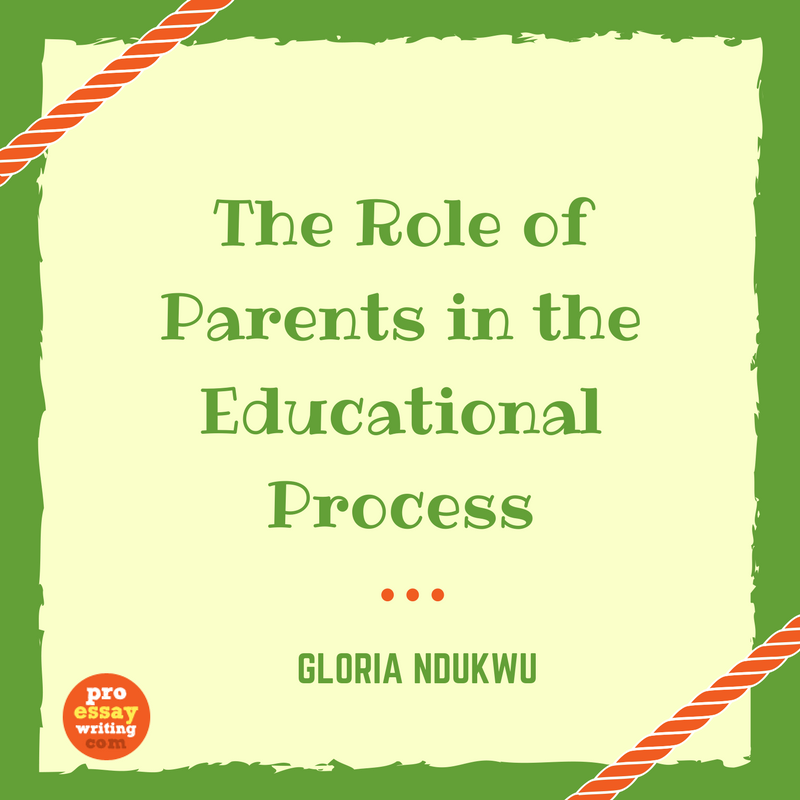 Each parent expects their children to gain foundational knowledge at school, but they also want them to develop ethical values and form character. That's where the traditional values of education become important again. The oral transmission of knowledge, art, ethical concepts and cultural heritage is the connective tissue between the school and society. Children gain those values by following the example and guidance of their parents. The parents can easily provide that guidance thanks to online sources of information, which made education more fun than ever. The advantages are immense. Children are able to develop skills and gain knowledge through games on their iPads. However, many parents are taking the children's inclination towards technology in the wrong direction. They use it to entertain their children. Teresa Belton, a researcher who examines the relationship between creativity, media and boredom, explains that parents are no longer leaving their kids to be bored from time to time. Her research revealed that these sources of entertaining information reduced children's imaginative capacities. The qualities such as confidence, playfulness, and curiosity are only partially obtained through the schooling process and online sources of knowledge. In that aspect of education, the parent's role is irreplaceable. When they realize the kids are bored, they shouldn't rely on the iPad. They should set challenges that encourage creative thinking and problem solving skills. They can ask questions, give them a prompt for a short story, explore the nature or think of another activity that will encourage children to think for themselves. By encouraging the will for learning in their children, the parents teach them that knowledge is not for grades. The purpose of gaining knowledge is to satisfy and support the inborn curiosity. The tests, as a mandatory method of assessment at school, are to prepare the students for what awaits them in college. Without the foundational education that the parent provides, the standardized textbooks and tests would lead the students into a creativity crisis. Ellis Paul Torrance, an American psychologists, started the research “Torrance kids” in 1958. His goal was to examine the creative capabilities of children, and he designed several creativity tasks. The children showcased their creativity by producing something original and useful. Throughout fifty years of tracking the creativity in children, patents, and research papers, they discovered a phenomenon called Flynn effect, meaning that each generation scored 10 points above. The problem is that since 1990, we've been witnessing a reverse trend, popularly known as creativity crisis. The decline of the creativity scores of younger children in America has been the most serious of all. When we relate this trend to Teresa Belton's findings, we can assume that the busy parents, who use technology as a way to save their children from boredom, have no space for development of creative thinking skills. When those children start school, the teachers don't find a proper foundation to build on. Big innovations are related to the way inventors developed their creative capabilities. Their mind was properly trained at school, but the role of the parents was just as important. The relationship one develops with their parents is one of the longest-lasting social relationships in their life. That connection is healthy when it is highly supportive and positive, but it also involves authority. The parent can use that authority to support the inborn creativity and plant the seed of wisdom in their children. They can do that with the help of online resources, but they mustn't use the devices as their children's escape from boredom. There is no single definition of creativity, but the labels behind it include deep understanding of human nature and flexibility to look at all issues from different perspective. Creative people are open to new adventures and turn wisdom into a practical skill. That is the kind of individual that every parent should try to raise.